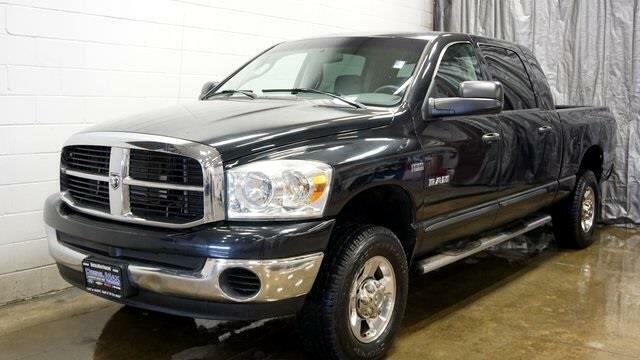 2008 Dodge Ram 1500 SLT 4X4 MEGA CAB Clean CARFAX. HEMI 5.7L V8, 4WD, 4-Wheel Disc Brakes, ABS brakes, Air Conditioning, AM/FM Compact Disc, Bumpers: chrome, Cloth 40/20/40 Bench Seat, Compass, Delay-off headlights, Driver door bin, Dual front impact airbags, Front Center Armrest, Front reading lights, Front wheel independent suspension, Illuminated entry, Low tire pressure warning, Mini Floor Console, Outside temperature display, Panic alarm, Passenger door bin, Passenger vanity mirror, Power door mirrors, Power steering, Power windows, Rear 60/40 Split Folding Seat, Rear reading lights, Rear seat center armrest, Rear step bumper, Remote keyless entry, Split folding rear seat, Tachometer, Tilt steering wheel, Trip computer, Variably intermittent wipers. Specializing in all makes models of trucks both diesel and gas. We have vehicles that no body else does. Please call us directly at (330)765-1200.